6th February 2018, New Delhi: The internet is a different world in itself and it has become a part of life of almost every person. Smart phones have brought them even closer to the world wide web universe. There are many positives that can be derived out of using the internet, but there are some negatives too. There have been many cases of young children getting lured to share photos, videos and information with those who should not have access to them. In some cases, private videos of middle school students shared on social media with friends have gone viral and done irreversible damage to their reputation along with mental harassment and no easy mechanism in place to get these videos removed from sites around the world. At what age children should be given access to social media sites in India has remained a topic of debate for quite some time now. 6th February is celebrated as the ‘Safer Internet Day’ across the world, which calls for creating a better internet for everyone, particularly for the young users. 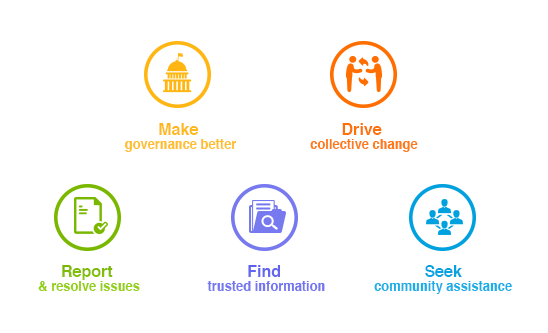 LocalCircles tried to gauge the citizen pulse on this subject in India by conducting a 3-point poll. The survey received more than 22,000 votes. The first question asked if the government and schools in India should define an age under which children cannot have social media accounts. 79% respondents agreed with it while 17% did not agree with it. 4% were unsure. Citizens are keen that the Government defines an age and then via the Education Boards, Schools and District Administration enforce the same. Children seem desperate to get onto social media platforms to get to know what is happening in the lives of their friends and family and don’t even mind faking their credentials to do so. In June 2012, Facebook, in a statement filed before the U.S. Securities and Exchange Commission, said that more than eight crores of its registered users had given false identities. This number would probably be much higher in India and a many of them would be children for sure. In many other countries, the minimum age of a person required to join a social media site like Facebook, Snapchat etc. is 13 years. However it is commonly known that many children tend to declare false age and create profiles. In some cases, parents are so keen that they create a child’s facebook page, right at birth. 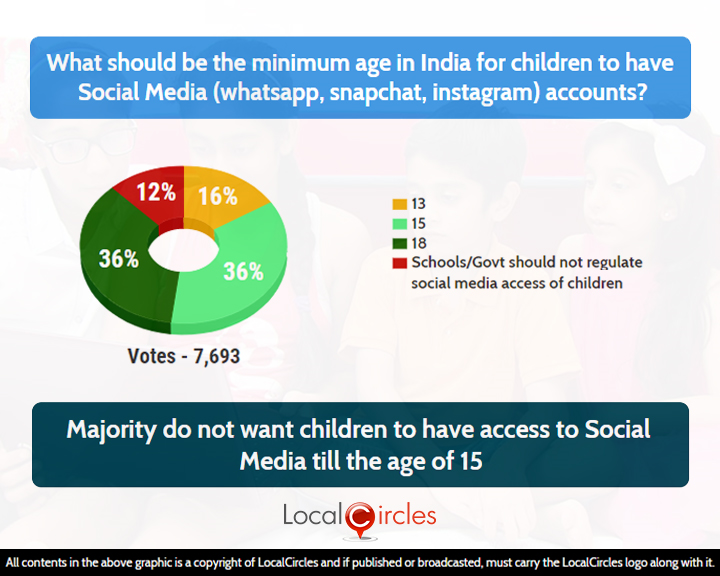 The second question asked what the minimum age in India for children should be to have social media (WhatsApp, Snapchat, Instagram) accounts.16% said it should be 13 years and 36% said it should be 15 years. Another 36% said the age limit should be 18 years while 12% schools or government should not regulate social media access of children. 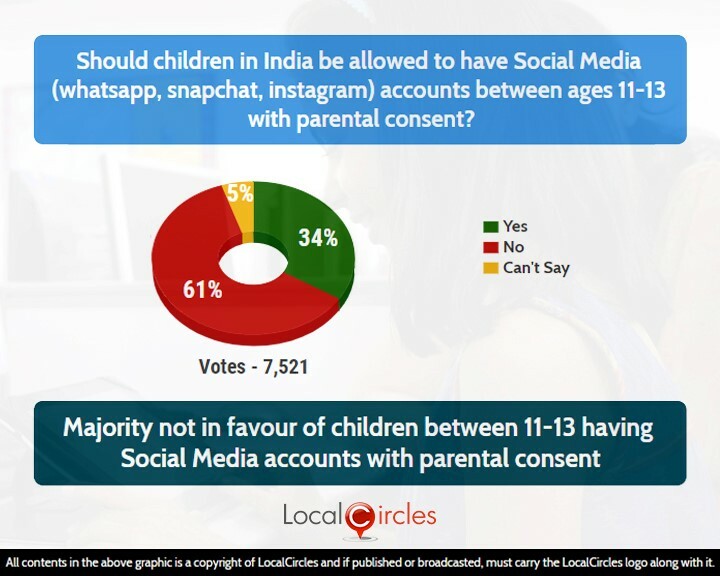 The following question asked if children in India should be allowed to have Social Media (WhatsApp, Snapchat, Instagram) accounts between ages 11-13 with parental consent. 61% responded in a negative while 34% responded said it should be allowed. 5% were not sure about their choice. Children have easy access to internet nowadays through smart phones, iPads, laptops etc. Cyber-bullying, leakage of sensitive information, parent’s personal details being compromised etc. are some instances that have been regularly reported in the online community being run by LocalCircles in association with the Indian Police Foundation for a safer India. Hiding from parents and getting on to social media sites will not solve any problems. 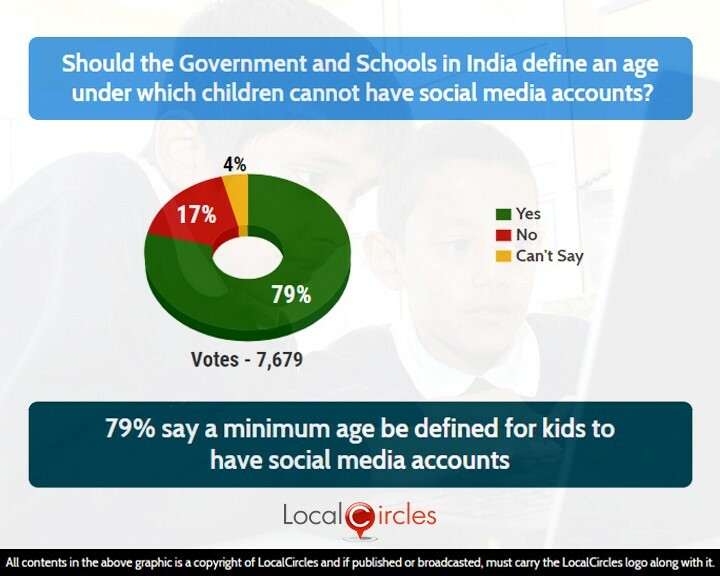 Citizens suggest that clear guidelines are made by the government to enable/restrict social media access for children in India and that parents play an influencing role in educating the child about the do’s and don’ts. Citizens also said that government should use education boards and schools as a medium to disseminate guidelines on parents making sure that children under the defined age do not have any social media accounts.